Film the Police? Not in Spain. Person 1: How are things going in Spain? Person 1: So all is fine? 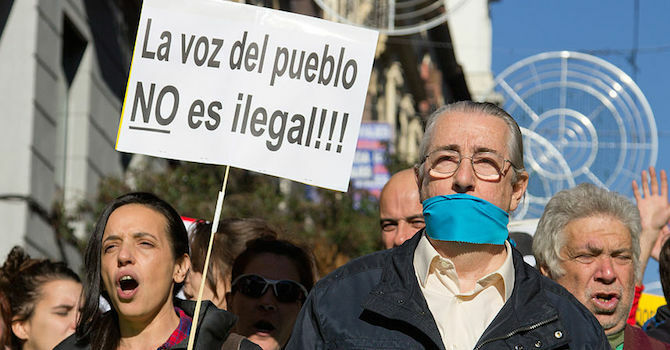 Its official name — Ley de Seguridad Ciudadana — translates roughly to Public Security Law, but it’s been more commonly referred to as la Ley Mordaza, or the Gag Law. With its implementation as of 1 July, the actions that are now criminal include showing insufficient respect to a police officer, protesting in public, and not having identification on you. Notably, it also outlaws the filming of police. Offenses are punishable by a fine, as high as €30,000 in the case of filming the police and up to €600,000 for offenses like protesting near utilities, transportation hubs, nuclear power plants or similar facilities. The law was far from popular when it was voted on in late 2014, and it’s only drawn more ire since — 75 percent of Spaniards are now against it, according to a poll by Spanish newspaper El Pais. It has awoken 15-M, a movement initiated in 2011 to push back against austerity measures, and spurred new opposition like Acampada Mordaza, an organizing effort committed to flouting the bans, and No Somos Delito (We Are Not a Crime), a group that projected holograms of protesters around Madrid after the law was voted in. Spanish speakers can keep up with developments from protestors using hashtags #acamapadamordaza and #leymordaza or via @AcampadaMordaza, the Twitter account of the ongoing demonstration in Madrid’s Puerta del Sol. WITNESS will also be following this and similar laws across the world as the right to record continues to be questioned, threatened, and taken away, so stay tuned to the blog. Featured image via Carlos Delgado/Wikimedia Commons.